GEORGIA TECH (US) — In the search for alternatives to conventional antibiotics, researchers have identified an enzyme that kills the bacteria that causes strep throat. The enzyme, PlyC, operates by locking onto the surface of a bacteria cell and chewing a hole in the cell wall large enough for the bacteria’s inner membrane to protrude from the cell, ultimately causing the cell to burst and die. Research has shown that alternative antimicrobials such as PlyC can effectively kill bacteria. However, fundamental questions remain about how bacteria respond to the holes these therapeutics make in their cell wall and what size holes bacteria can withstand before breaking apart. Answering those questions could improve the effectiveness of current antibacterial drugs and initiate the development of new ones. Researchers recently conducted a study to try to answer those questions. Their findings appear in the Journal of the Royal Society Interface. The scientists created a biophysical model of the response of a Gram-positive bacterium to the formation of a hole in its cell wall. Then they used experimental measurements to validate the theory, which predicted that a hole in the bacteria cell wall larger than 15 to 24 nanometers in diameter would cause the cell to lyse, or burst. 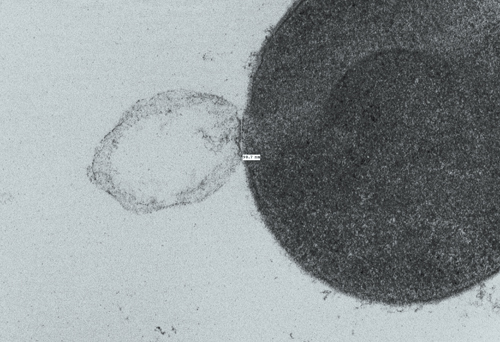 These small holes are approximately one-hundredth the diameter of a typical bacterial cell. “Our model correctly predicted that the membrane and cell contents of Gram-positive bacteria cells explode out of holes in cell walls that exceed a few dozen nanometers. This critical hole size, validated by experiments, is much larger than the holes Gram-positive bacteria use to transport molecules necessary for their survival, which have been estimated to be less than 7 nanometers in diameter,” says Joshua Weitz, an associate professor in the School of Biology at the Georgia Institute of Technology (Georgia Tech). Common Gram-positive bacteria that infect humans include Streptococcus, which causes strep throat; Staphylococcus, which causes impetigo; and Clostridium, which causes botulism and tetanus. Gram-negative bacteria include Escherichia, which causes urinary tract infections; Vibrio, which causes cholera; and Neisseria, which causes gonorrhea. Gram-positive bacteria differ from Gram-negative bacteria in the structure of their cell walls. The cell wall constitutes the outer layer of Gram-positive bacteria, whereas the cell wall lies between the inner and outer membrane of Gram-negative bacteria and is therefore protected from direct exposure to the environment. The researchers developed a biophysical theory of the response of a Gram-positive bacterium to the formation of a hole in its cell wall. The model detailed the effect of pressure, bending, and stretching forces on the changing configuration of the cell membrane due to a hole. The force associated with bending and stretching pulls the membrane inward, while the pressure from the inside of the cell pushes the membrane outward through the hole. “We found that bending forces act to keep the membrane together and push it back inside, but a sufficiently large hole enables the bending forces to be overpowered by the internal pressure forces and the membrane begins to escape out and the cell contents follow,” says Weitz. The balance between the bending and pressure forces led to the model prediction that holes 15 to 24 nanometers in diameter or larger would cause a bacteria cell to burst. 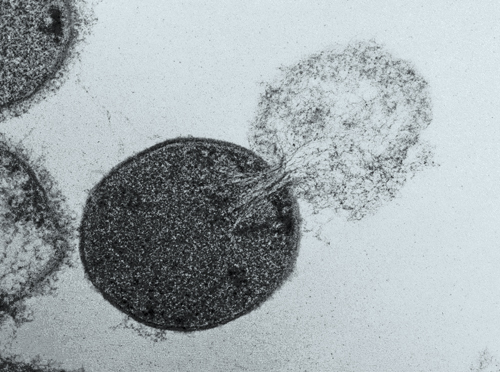 To test the theory, Daniel Nelson, an assistant professor at the University of Maryland, used transmission electron microscopy images to measure the size of holes created in lysed Streptococcus pyogenes bacteria cells following PlyC exposure. Nelson found holes in the lysed bacteria cells that ranged in diameter from 22 to 180 nanometers, with a mean diameter of 68 nanometers. These experimental measurements agreed with the researchers’ theoretical prediction of critical hole sizes that cause bacterial cell death. According to the researchers, their theoretical model is the first to consider the effects of cell wall thickness on lysis. “Because lysis events occur most often at thinner points in the cell wall, cell wall thickness may play a role in suppressing lysis by serving as a buffer against the formation of large holes,” says Gabriel Mitchell of Georgia Tech. The James S. McDonnell Foundation and the Burroughs Wellcome Fund supported the research.